NRF2-dependent toxin and ROS scavenger pathways are suppressed in pathological mouse CFs in a p38-dependent manner. (A) Western blot for NRF2 on nuclear and cytoplasmic protein lysates from neonatal mouse CFs treated with vehicle, ROS (50 μM H2O2), IGF-1 (100 ng/ml)/ROS, or TGF-β1 (10 ng/ml)/ROS. Lamin A/C and β-tubulin are used as controls for nuclear and cytoplasmic enrichment, respectively. (B) Quantification represents 3 independent experiments. (C) qPCR analysis of Mt1/2, Acta2, and Col1a1 expression in neonatal CFs treated with ROS, IGF-1/ROS, or TGF-β1/ROS, compared with vehicle controls. 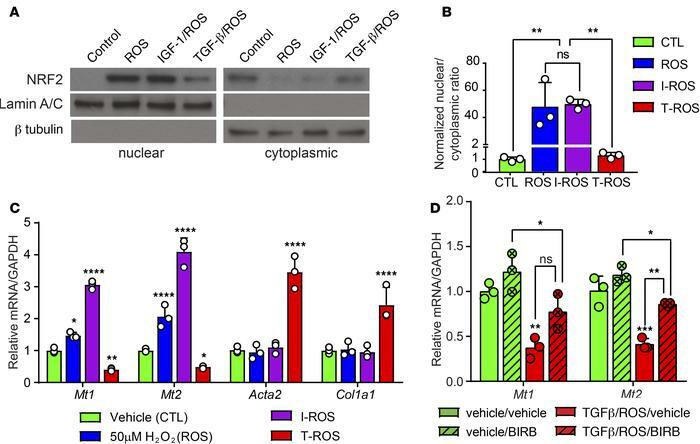 (D) TGF-β1/ROS–dependent suppression of Mt1/2 expression in mouse CFs is rescued by treatment with a pan-p38 inhibitor (BIRB796, 5 μM) (n = 3 per treatment). Statistics in B–D were performed using 1-way ANOVA and Tukey’s post-hoc test (n = 3). *P < 0.05, **P < 0.01, ***P < 0.001, ****P < 0.0001.